AvalonBay Communities is planning a new 33-story, mixed-use residential tower at the site of the former American Bible Society located in Lincoln Square. The building will house 160 apartments. There will also be 34,000 square feet of retail space on the lower levels. 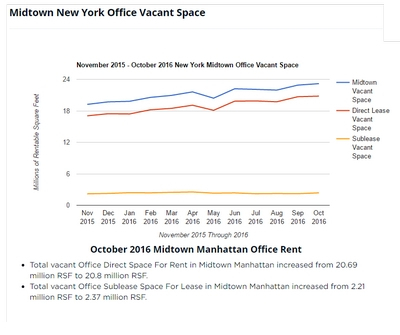 Vornado Realty Trust lauded a third quarter that saw it sign seven Manhattan office leases at asking rents of over $100 per square foot. 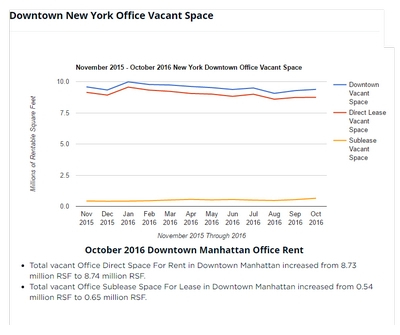 Vornado completed 43 office leasing deals totaling 509,000 square feet in the third quarter at an average starting rent of $79.80 per square foot. 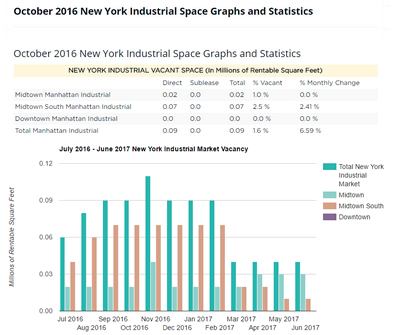 The total year-to-date leasing activity was nearly 1.7 million square feet with average starting rents of $80.09 per square foot. 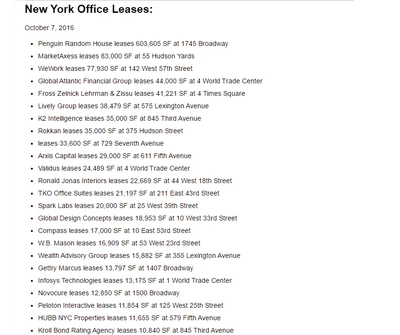 Seven of those 43 leases, aggregating 69,000 square feet, were done at asking rents of over $100 per square foot. 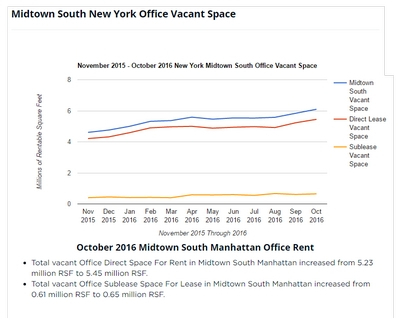 24% of Vornado's total Manhattan leasing activity this year, around 400,000 square feet, was signed at average asking rents of $108 per square foot. The Lowline may soon become a reality. The city is considering proposals for the 60,000-square-foot former trolley terminal beneath Delancey Street. The Economic Development Corp. will put out a "Request for Expressions of Interest" for the Lowline space. 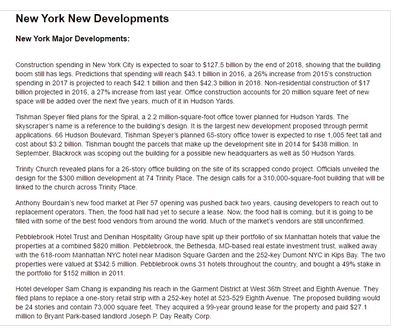 Quadrum Global is planning to develop a 26-story, 500-key hotel in the Garment District. Quadrum Global partnered with Sam Chang last year to buy the site of a two-story office building at 351-353 West 38th Street. Each firm paid $56 million. The plan was to subdivide the site, which offers a total of 250,000 buildable square feet, into two hotels to be developed by each party. Quadrum's planned hotel will span 125,000 square feet. If the firm receives a city approval to buy additional air- rights, the proposed property could be 150,000 square feet. The Rockefeller Group is planning a $325 million makeover at the former Time & Life Building at 1271 Avenue of the Americas. The developer is planning to replace the building's entire curtain wall, 450,000 square feet, to create a more transparent, light-bathed interior space. Stella McCartney is negotiating to open its first Madison Avenue store, just north of the Upper East Side's "Gold Coast" corridor. The retailer is looking at a 1,600-square-foot, ground-floor space at 929 Madison Avenue, a five-story, 8,000-square-foot townhouse near East 74th Street. Asking rent on the ground floor is around $1,000 per square foot. Cohen Brothers signed a lease with Saks OFF 5th for 56,000 square feet at 135 East 57th Street. The clothing store will occupy three levels, with around 2,000 square feet of frontage. 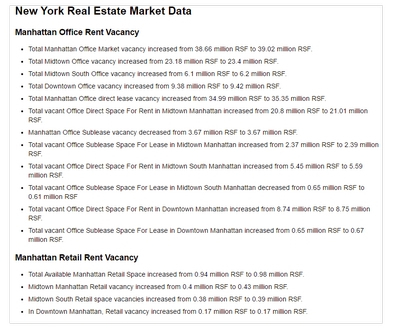 Asking rent for the space, largely empty since 2009, was $120 per square foot. The Museum of Modern Art is moving ahead with plans for an estimated $93 million expansion at the former home of the American Folk Art Museum. The plans for an adjacent lot, at 45 West 53rd Street between Fifth and Sixth avenues, call for 32,842 square feet of new space, which will include theaters, a library/lounge, classrooms, exhibit space and gardens. Target will open its first small format store in Manhattan next year, at a two-story, 45,000-square-foot location at 255 Greenwich Street. The store will be about a third the size of a regular, suburban Target store. It will feature more city-appropriate home goods as well as a range of grab-and-go food options. It will also offer in-store pick-up of items ordered online. A report suggests that Brooklyn Bridge Park pay $250 million to protect 10,000 wooden piles before they deteriorate, a bill that will be partially covered by development planned for Pier 6. The park should take a preventative approach by covering the wooden supports with a layer of protective epoxy, a type of synthetic material that sets permanently when heated. The measure could save the park $84 million, since repairing each pile piecemeal could cost $334 million. The park has already fixed 3,000 wooden piles. Toll Brothers City Living plans for an 18-story condo building on the Gramercy Park site it bought last year for $135 million. The new building will rise at 122 East 23rd Street. It will contain a total of 133 units within 225,000 square feet of space. The building's ground floor will contain four retail condo units totaling 12,000 square feet. Reading International and their Upper East Side neighbor at the corner of 60th and 3rd Avenue are talking about collaborating to develop their properties across the street from Bloomingdales. The theater which sits mid-block at 1001 3rd Avenue and the four-story walkup next door at the corner could be combined for a total of 94,120 buildable square feet. An extra 15,000 square feet of air- rights may also be available. Wharton Properties and General Growth Properties re-signed luxury retailer Bulgari to a new, 15-year lease at 730 Fifth Avenue. Bulgari signed a new lease at market rents and will continue their corner presence. Bulgari will be downsizing its space taking less than its current 3,675 square feet on the ground floor and giving up approximately 6,000 square feet of upper-level retail. The deal's total value, once free rent and other considerations are taken into account, could reach up to $5,500 per square foot, with annual rent in excess of $16 million per year. Advertising and marketing GroupM is to expand its space at 3 World Trade Center. GroupM signed a deal to anchor the 80-story, 2.8 million-square-foot tower two years ago agreeing to take 515,000 square feet, which is to open in 2018. But the advertising firm is now looking to add at least 150,000 square feet, which could reach 300,000 feet. Port Authority of New York and New Jersey. ">The Port Authority of New York and New Jersey finally admitted to a water leak at the World Trade Center that caused construction delays at the site. Construction workers reported hearing water rushing behind an underground concrete wall that encases the 16-acre site and protects it from the Hudson River. The slurry wall, installed in 1960 during the construction of the original World Trade Center, is 3,200 feet long, 4 feet thick and around 100 feet deep. 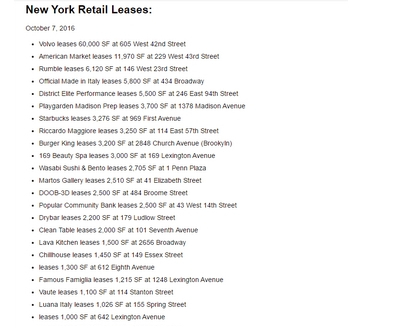 The leak contributed to delays in opening the new complex's grand lower concourse, which will house around 125 high-end retail tenants. Engineers traced the leak to the roof of the World Trade Center's underground complex, which includes the transportation hub, the 9/11 museum and retail space. The American Museum of Natural History trustees approved plans for a $325 million new addition to its Upper West Side building. The new 218,000-square-foot space will feature vast, open interiors and undulating curved surfaces in contrast to the existing building's squareness. The city's Landmarks Preservation Commission must still approve the plans. The new addition is to be completed by late 2019 or early 2020. Plans call for the demolition of three existing buildings so as to take up less new space, a move meant to address concerns expressed by residents that the new addition would impinge on the park. New York's Economic Development Corporation is calling for proposals to redevelop 124 East 14th Street, a city-owned site currently home to a P.C. Richard & Son store. 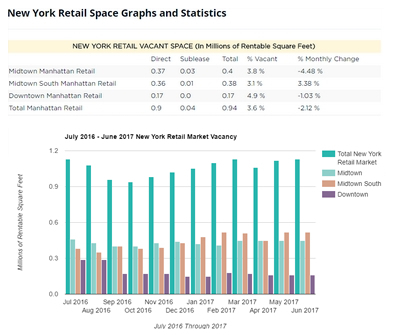 The city's guidelines encourage developers to build office space at Union Square location, targeting startups that outgrow incubators and coworking spaces such as those managed by WeWork. China's Central Bank is moving forward with capital markets reforms that could make it easier for Chinese citizens to invest in New York real estate and allow residents of a Shanghai free-trade zone to buy overseas assets directly. This is a trial run for the rest of China and part of a broader effort to loosen capital controls. The move would also open up Yuan-denominated bonds to foreign companies. The announcement comes despite an uptick in capital outflows from China in recent months, which would normally provide an incentive to tighten capital controls. In September alone, investors pulled $194 billion from the country. Time Warner released plans to move to Hudson Yards from Related's Time Warner Center. 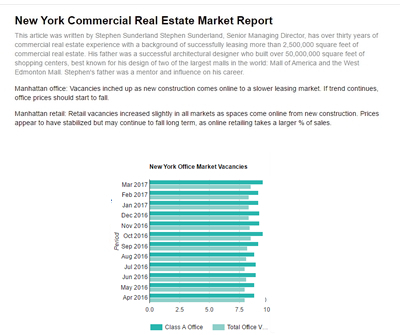 Related bought the media company's Columbus Circle headquarters for $1.3 billion in 2014, up to buy a 1.6-million-square-foot commercial condo at Hudson Yards' second tower. With a total of 6.2 million square feet of mixed-use development scheduled for completion in 2024, the second phase of Hudson Yards will be roughly half the size of the first. Sitting between 11th and 12th avenues with views of the Hudson River, it will include seven residential buildings, compared to two in Phase 1. It will also include a 750-seat public school. Related is also planning a 2-million-square-foot office building. The Western Yard will be driven by market demand. 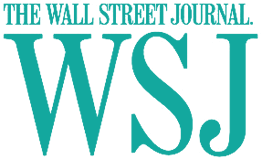 Silverstein Properties is aiming to raise about $500 million in financing through the EB-5 visa program to fund construction of 2 World Trade Center. 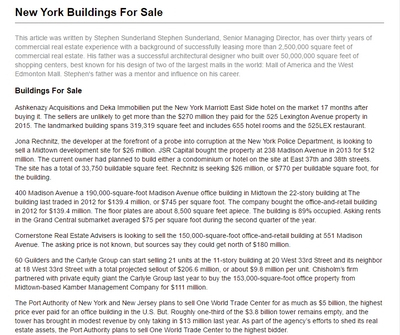 Silverstein, which is developing the 2.8 million-square-foot tower along with the Port Authority of New York and New Jersey, Normally investors are required to contribute $1 million, but that limit is cut in half in areas where the unemployment rate is 1.5 times the national rate. 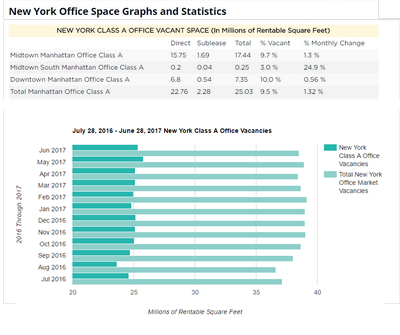 WeWork signed a sublease for 110,000 square feet at 300 Park Avenue. The last gas station in the East Village at 24 Second Avenue was bulldozed to make way for 45,000 square feet of condominiums with 5,700 square feet of retail. AORE Holding, who purchased the site last year for $32 million, is developing the 10-story building at the former BP station site. The site is the last undeveloped piece of land in this neighborhood.